I have had a few emails/PM’s regarding this planner that I made a few months ago. I thought my tutorial this month would be the perfect time to give some specifics and encourage you to create one of your own. It’s a very simple project – but I just hope that I inspire you to run with the CONCEPT of it. I think it’s an idea that truly sets you up for success. The amount of pieces is up to you. My planner has a total of 10 pages. One cover, One for every two months, one for postcards, one for anniversary, and one for just because cards. 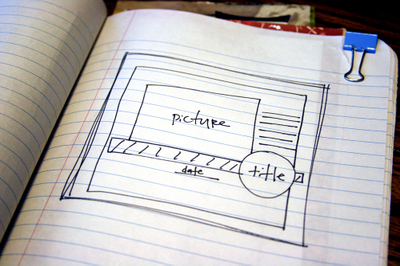 If you didn’t want your planner to share a page amongst months – then you could always add as many pages as you want. If you don’t have lots of dates to send cards for – you could triple up the months. Completely your call. Scraps @ least the size of your album in length. The painful truth is that we all forget birthdays. We have. If you say you haven’t then either A) you are lying or B) you are my husband’s grandmother who in the 13 years I’ve known her has never missed a family member’s birthday. EVER. She inspired me to create this planner. 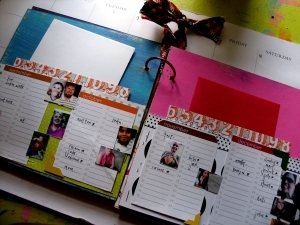 I remember having an organizer back in high school that was similar to this. It was by this artist Marjolene Bastin who drew the cutest little fuzzy bumblebees. (off subject sorry) So, using that idea – I decided to make one a little hipper, a little cooler, and a lot more personal. Think of the obvious ones. Your spouse, boyfriend, parents, children, best friend etc. Reach out and find them. Send out a mass email to everyone you would actually want to mail a card to. Don't be embarrassed or shy - just be honest. Let them know that while you may have sucked in the past @ remembering birthdays...you now have a solution to not only remember but to be on time. When racking your brain for "who" to send this mass email to - think family, friends, work buddies, your spouse's work buddies, Internet friends, your children's teacher/coach *Don't forget to ask for anniversaries and/or their children's birthdays if applicable. Start a list - categorized by month of all the birthdays/anniversaries that you remember and that you requested via email. As the individuals respond, jot the date down next to their name. If they don't respond do your best to @ least remember the month, and make a special note of it. This would also be a nice time to update your address book - and ask them for their address as well. I mean it doesn't really look to snazzy if you remember their birthday, make/buy the card, then go to mail it and realize you have to email them or call them for their address. Just go ahead and knock that out too! 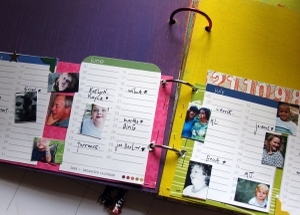 Gather Photos – Using the list of people that will be listed in your planner – print some photos of them to add a personal feel to your planner. I used the software that coordinates with my printer to print my images. I chose a size that is a tiny bit bigger than index prints, and I was able to print them all at one time. This is something you can be getting together while compiling all the names and dates. *Just think all this hard work will serve as a quick reference for all your Christmas cards this year. You did promise you would get them out earlier this year right? Heck - I promise to get them out @ ALL this year. I personally recommend at least 8x8 – since this is going to be a home for cards. If you have an album that you have yet to use – or that could use a major makeover, go with that. I used http://www.fontwerks.com/Store/view_product.php?product=ch-846&cat_id=17 Fontwerks 8x8 album. Thick cardboard – or even the 12x12 cardboard would work perfectly. I have been told some scrapbook stores have an ABUNDANCE of these – and I’m sure would be willing to give them to you for free or at an extremely reasonable price. 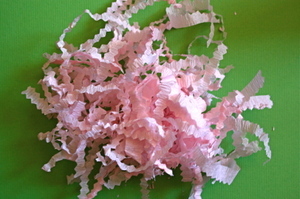 It is often times in your online scrapbook orders too – to keep the paper from getting bent. If needed cut pages down to the size of your choice. 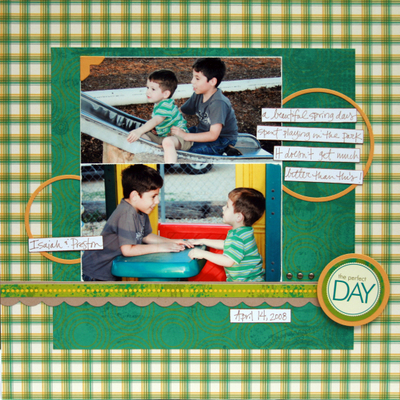 When gathering your patterned paper consider that theme as well. 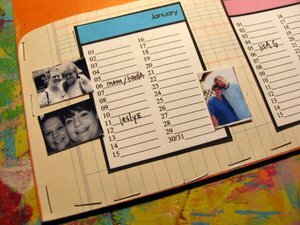 You could even go with a numbers theme – and use all your number paper/stamps. 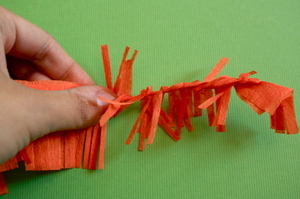 With the cardboard pages, you will simply paint them in the color of your choice. (Round the corners of the cardboard if you like! 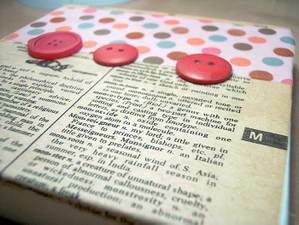 After you’ve painted the cardboard – choose one for your cover and you can embellish that in the end. The reason I say at the end, is so that you are able to work with the other side freely without fear of damaging your cover. 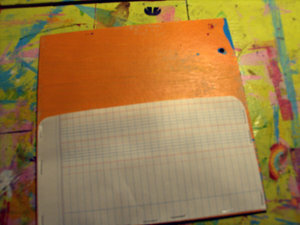 Arrange your painted cardboard pages in the order that your book will go in. 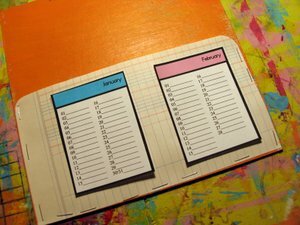 Gather your patterned paper and coordinate it with the colors/months and decide what will go where. Adhere the patterned papers (whether they were scraps you want to use up) or brand new paper you have been dying to use. Cover at least half of the cardboard so that it can support the cards properly. 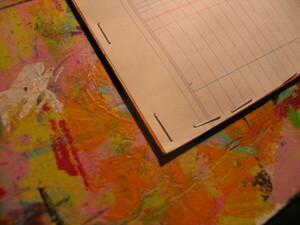 You can round the top two corners to give it a folder look – or leave them as they are. 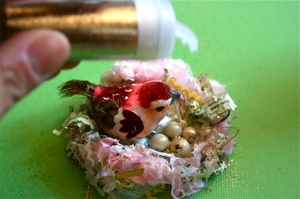 Use the adhesive method of your choice all the way around the edges EXCEPT FOR THE TOP. The more closely you stick to the sides – the more room you will have inside your pocket. When choosing the method of adhering your paper to make the pockets take into consideration that you want to make this nice and durable. I myself am a staple girl. Its easy, quick, stronger and a lot cheaper than adhesive. 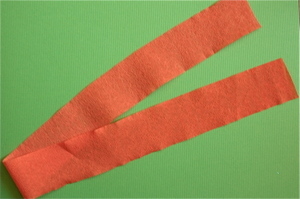 But a nice strong double sided tape will work just as well. Since my album was pre-made – it came with the three holes punched and three jump rings. 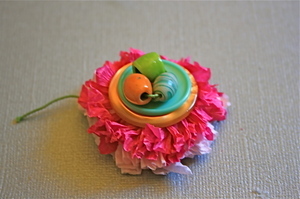 I chose to use only the top jump ring because it didn’t move properly – it was stiff – and I wanted to be able to flip it over easily while adding things. Decide what is best for you and your planner. You cool girls with a bind it all machine could totally use that on this bad boy. It would be perfect. 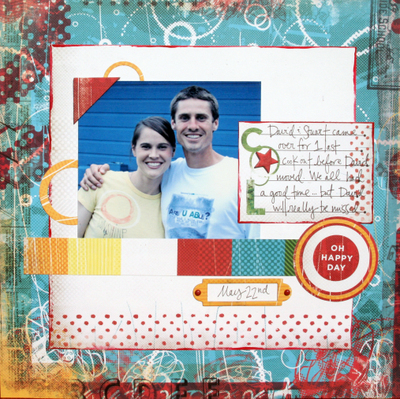 Make it a goal that every time you sit down to scrapbook, you make at least ONE card with the leftover scraps from the page or project you were working on. The cool thing is that I can add cards that I make into it at anytime...that way when the first of the month comes and its time to send cards - they are ready and waiting on me. My children and I have mail night at least once a month. We live 10 hours away from 95% of our families and friends. So we have to set this time aside for communicating with our loved ones. Its not enough to THINK about them. We have to make it real. So, during mail night, I review my planner for the upcoming month and make cards or write a letter to the people I have listed. I add a stamp and IMMEDIATELY put them in the mailbox. (If not right then, the next morning) Consider it done. Not only DONE, but on time. If you want to complete the card/letter, stamp it – and put it back in the coordinating month and send it closer to the time – you could do that to. Just don’t be like the old Ashley and create the card, write the message, stick a stamp on it – and never mail it…because let me tell you – your best friend won’t want to hear it. 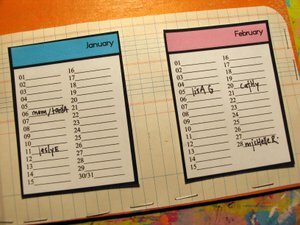 Now that this planner is starting to come together with the painted pages – and pockets, you need to add your calendars. If you are using the PDF file that I have provided for you – simply print those out and attach them with their designated page/pocket. I have the word document that I used to create this. Its is very basic – but I will gladly email it to you if you like so you can make adjustments to cater to your style/direction. 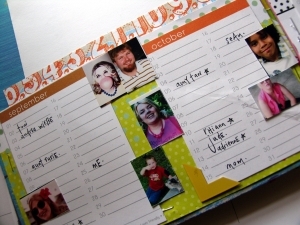 List the due dates of your expecting friends in pencil so you are aware of that fast approaching date. You can be ahead of the game on a shower gift/card. 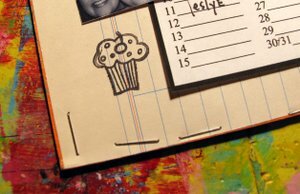 Once the baby is born – be sure to update your planner in pen to show baby’s birthday! Now, get a nice pen – and fill in those dates. Whether you printed a page full of fresh index prints – or decided to use some that were already printed and on hand – cut those out and place them on the pocket of the month they belong to. Use your stash and add some fun stuff. Add cupcakes or candle stamps. Star stickers. Anything in your stash - make it yours. Make it fun. You will be the one looking at it - do your thing. 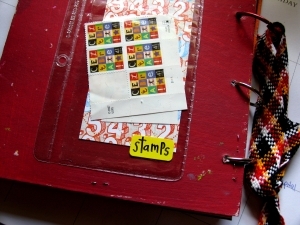 Using a clear pocket from an old Dayrunner– I created a spot for stamps on the back. Again – another step that will eliminate any possible excuses for not mailing these cards and letters! As always - if you have any questions - or need me to explain anything further feel free to ask! The day to rid yourself of all that stuff that is holding you down. All the pretty paper you knew you'd use one day. 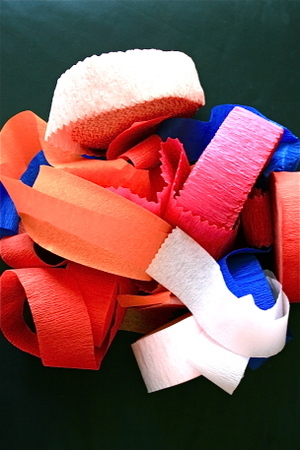 All that ribbon and fiber and those eyelets and decorative scissors that haven't seen the light of day since 1998. Box 'em up and move 'em out! Purge. Pare down. Throw away. Donate. It's time to get rid of all of it--and I challenge you to start. NOW. Don't worry--we all have to purge, whether you're a packrat like me or a neatfreak like my friend Kelly, who I swear buys things at the store and brings them home & immediately puts them in her garage sale pile. : ) No matter where you fall in this line, I'll bet you could use to spend a little time going through all your paper & stickers & rub ons and ridding yourself of all the clutter. This is what I do--and I am by no means an expert, but I do have to find a way to be a little discerning about my purging...otherwise, I'll find a way to convince myself that I really do "need" that half-inch strip of Chatterbox Sunroom. Or that I might use it when I make a baby book for a gift or layouts for my mom or mother-in-law--afterall, they won't care that it isn't the latest and greatest. Except that I won't want to use anything other than my new stuff so there it all sits, gathering dust and making piles on top of the piles I already had. My way to do things is to look at it and ask myself "If I saw this in the store for the first time today, would I buy it?" If the answer is no, in the box it goes. Pretty simple, right? Be honest with yourself and also think about if you were shopping at your yard sale--don't put things that are broken or practically used beyond their life on the sale. I know I wouldn't like it if I had to sift through trash to find one good thing...in fact, I'd give up before I'd do that. Or if I have more than one of any item (like packages of brads, for example) I only need one. The rest go into a box to donate. Stickers got a little tricky when the whole "mix & match" alphabet craze hit the scene but again, I try to be honest with myself about whether or not I would purchase it if I saw it new in a store. I have been scrapbooking long enough and I'm now comfortable enough with my own style to know what kinds of fonts I like and what colors I will or will not use--no matter how cute or how colorful, if it isn't black, brown or white or in a classic type font, I probably won't use it. I know this about myself and that knowledge is helpful when purging my stash. 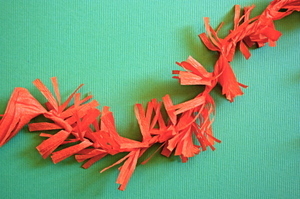 Ribbon & fiber can easily get out of control. 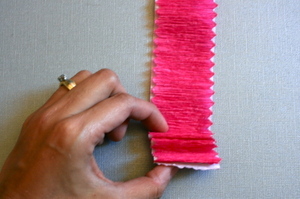 I use embroidery floss cards and wind the ribbon onto them and then store them by color in floss boxes. It's easy to see what I want and the rainbow of colors & patterns are happy to look at. Since buying the Zutter, I've pared down my album stash--I know that I won't use those 7Gypsies minis again so there's no need in keeping them around. And when it comes to stamps, if I haven't used them in the past year, they're outta here. Ink--the same thing. Idea books and magazines are probably the easiest thing for me to rid myself of--I only keep the ones from the past twelve months and those I'm published in. If there's a layout in particular that I love in a magazine, I tear it out and keep those in a binder. It may feel strange to rip pages out of a book but you know what? I bought it. It's mine to tear out pages from. And I'd rather have one little page than an entire heavy book. Okay--so now that you have a huge stack of no-longer needed things...now what? You can do so many things--you can prepare it all for a garage sale and make some money so you can buy new items. Check with your LSS--sometimes they have a garage sale once or twice a year where you can sell items at the store, who will in turn give you store credit. You can donate it to a local children's hospital. Or to a Girl Scout troop. ETA: I didn't even touch on recycling--which I'm all about. Contact your public library to see if they can use your older (but not ancient) idea books and mags. 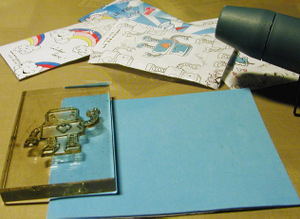 They may also have a die cut machine and would possibly like your larger paper scraps to use with it. And whatever can't be donated or sold, throw into your recycle bin. I know that my recycle center doesn't take glass but whatever else I have (paper, plastic, aluminum, etc) is fair game. To be completely honest, the only thing I throw in the regular garbage can is diapers and beer bottles--everything else can & should be recycled. And then, when you've finished this session of fall cleaning you'll feel content. Relieved. INSPIRED. Your mojo will return and you'll want to scrap. Best of all, you'll know where everything is located in your room so your pages will come together at a much faster rate--no more spending valuable time searching for items you are sure you bought but can't seem to find. I'd love it if you'd take a moment and share with us your organizational tips and tricks--I know I can always use a little extra motivation in this department! One final thought: "Having storage is not the same as being organized." 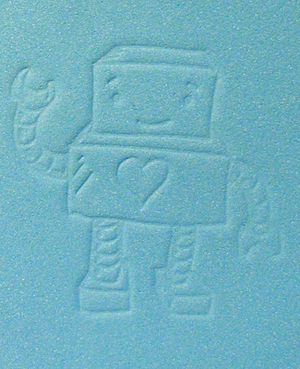 So lets do emboss on foam to make our unique embellies? I know some of you already have seen it but it’s always a good idea to share something cool with who is a beginner right? 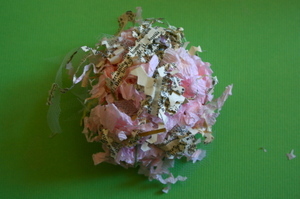 Or maybe you do scrap for a long time and you haven't seen it before so either way here we go. 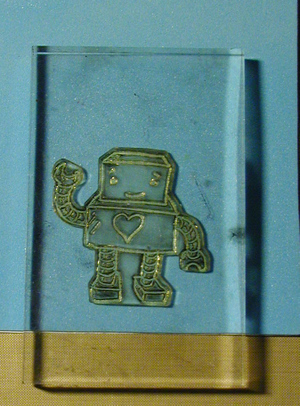 First you need to choose the stamp image you want to use then with a heat gun warm up the foam surface that you want to emboss. Then quickly stamp your motif on it. Press it down while it's still warm. 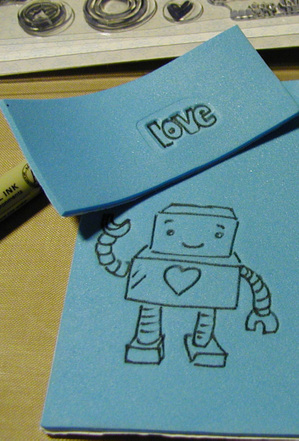 You can doodle with a sharpie or you can leave it as the original image. 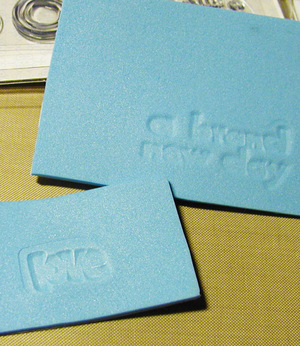 Cut it out the embossed figure and use it on your projects. I have used in some Los and people always ask me what was it. So now you know one more easy trick. Here you can see two samples where I used it. First one was for the last challenge for the Fashionista's call. 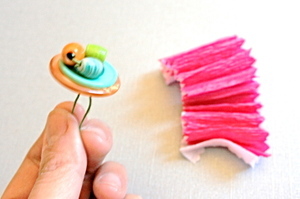 I did all the fairies dresses using this fun technique. 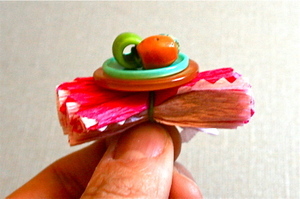 And the second one was this Lo I did while ago for scrap musik blog. I used on the word "sorry" and that band-aid. Okay guys I really hope that you enjoyed and had fun with it. I have a worn out composition notebook that I have filled with random sketches. 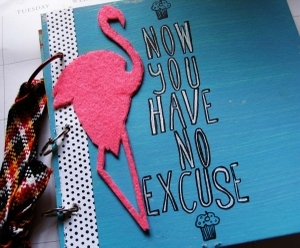 This is my go-to notebook when I am stuck and need something to get me going. My challenge for you today is to use one of these sketches and go with it! I have made a couple of layouts using it and now I want to see how you use it. I have followed the sketch pretty closely but you can rotate it, turn it upside down, or change it however you want. Let it be your jumping off point and see what you can come up with! I would love to see what you can make based on this sketch! EDITED FRIDAY SEPT 19th: We have a winner! The random number generator at Random.org picked #57 which is Kathy Eddy! Kathy, email me your address and as soon as the Multi Medium is ready, I'll ship it to you! Hi there! 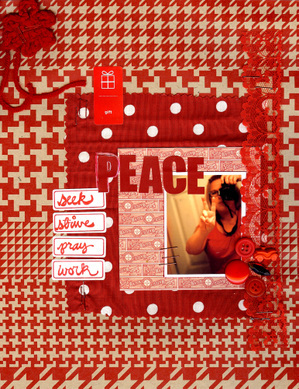 this is Claudine Hellmuth with today's SIS tutorial! 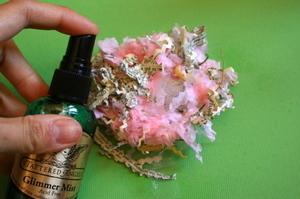 I often get asked how to glue papers with gel medium and not get bubbles. There is a little trick to it and I'll show you my technique! Using gel medium to glue your layouts or artwork is a great way to protect your work, you'll create a smooth, waterproof and archival surface which will stand the test of time. First let's talk about what gel medium is. 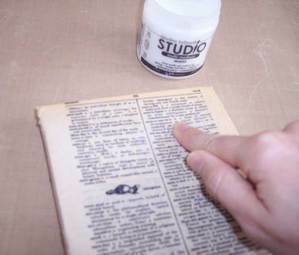 Gel medium is essentially acrylic paint without the pigment, so it dries clear. 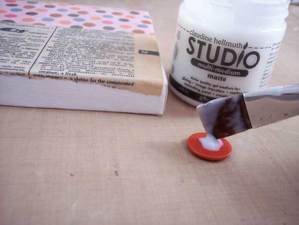 It is used to seal surfaces as a type of varnish, you can mix it with your acrylic paint to make the paint into glazes. 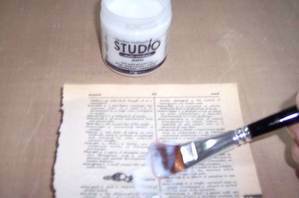 And because it is archival and non-yellowing many people like to use it as their glue.I have used gel medium as my glue for 19 years and I can't even think about using anything else! Many different companies make gel medium and some are thicker or thinner than others, some come in a matte finish, semi-gloss or gloss, you'll find the one that works right for you. I am so excited because I got to create my own dream gel medium with Ranger that has all the elements needed to make it perfect for mixed media use! I'll be using my Multi-Medium in Matte from the Claudine Hellmuth Studio product line for this demo. 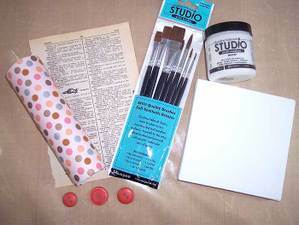 To get started here are the supplies that I am using. 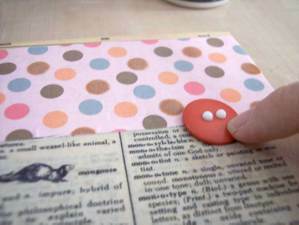 A small canvas, a dictionary page, gift wrap, a few small buttons (I'll show you how to glue small objects too! ), paint brushes and Multi-Medium from my Claudine Hellmuth Studio Line with Ranger. 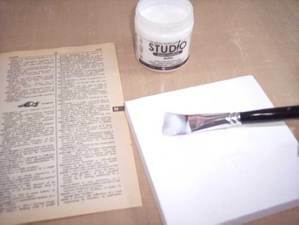 The first step to gluing without air bubbles is to coat your surface with a nice thick layer of Multi-Medium. You want to make sure to go back and forth and that there are no areas without medium. If you have any gaps in medium you will create an air bubble. So take your time and get good coverage. 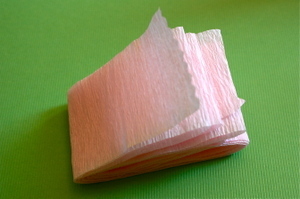 Then lay your paper down on top of the wet Multi-Medium. Don't press down at first. 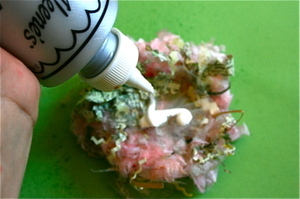 Then take your brush with more Multi-Medium and spread it on top of the paper starting in the middle and spreading from the center out. 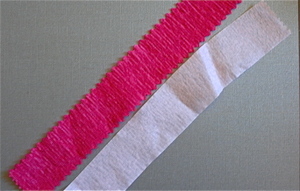 This will force out any air to the outer edges of the paper and off your artwork. 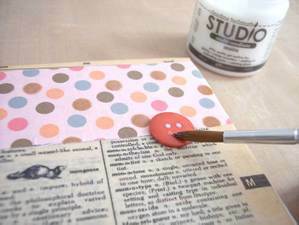 The larger the size of paper you are gluing the trickier it can be to not have any air bubbles. 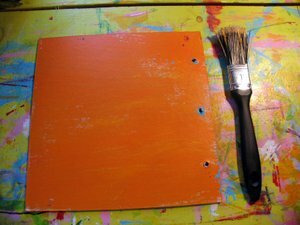 If you are working on a large size piece of paper you need to work fast to make sure the medium doesn't dry before you have the chance to press the bubbles out. Sometimes I like to take my finger and smoosh around on the paper to really make sure those air bubbles are out. if I see any I can take my finger and gently coax them away to the edge. This only works while the medium is still wet on top. It acts a lubricant so that way I don't tear the top layer of paper. Here I repeated the process again with a layer of wrapping paper on top of the dictionary page. 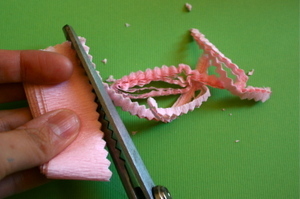 You can layer as many layers of paper as you like using this method. 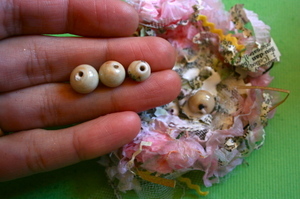 Here's how to glue a button. Add a glob of Multi-Medium to the back of your button. Press down to your surface. 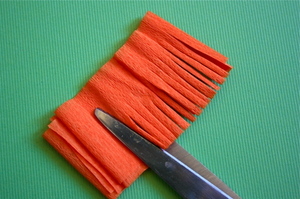 Then take a clean brush and clean up the excess. Wait to dry and viola! It will be glued on there forever and because of the flexible nature of the medium, you will never have to worry about it falling off! Here's an extreme closeup of the finished gluing demo so you can see how smooth the surface is. Now I have created a nice waterproof and archival surface that will stand the test of time! 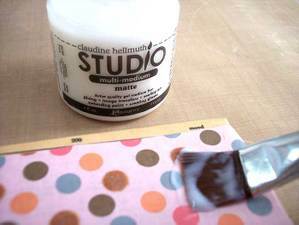 WIN A JAR OF CLAUDINE HELLMUTH STUDIO MULTI-MEDIUM! To celebrate the launch of my product line I am doing a special give away with this tutorial! Post a comment below and you'll be entered to win a jar of my Claudine Hellmuth Studio Multi-Medium! I'll pick a winner at random on Friday evening at 8pm EST. this is stacey, filling in for the lovely nikki whilst she sits by a pool in mexico soaking up the rays! my challenge for you today is a simple one. i challenge you to scrap a monochromatic layout. but the twist is, it has to be a color that you don't love! therefore, if you naturally reach for hues of green and blue when creating you cannot do a all green or blue layout! i decided to attempt an all red page. not that i have anything against the color red but i don't usually use it, unless it's to compliment teal or another groovy color :) and it was actually fun to try to dig out all red stuff from my stash, it actually prompted me to use some older supplies......hmmmm.... maybe i'll be brave and try purple next! now dig out some unloved supplies and make me something mono!! 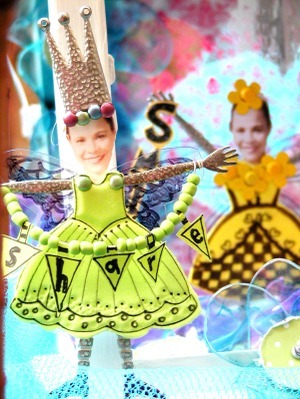 A few years ago I was knee-deep in the altering stage of this game we call scrapbooking. I altered everything--metal lunchboxes, breakfast trays, cigar boxes...you name it, I was adhering paper to it. My husband told me he didn't dare stand too still for fear of having paper and photos mod-podged to him! ; ) Well...it wasn't long before I grew weary of all the sticky glue and the little pieces of paper around me and I embraced my roots of being a simple, linear scrapper. 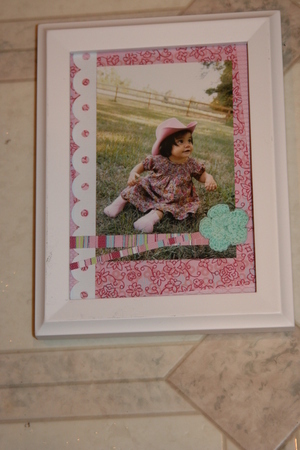 I put all my Mod-Podge in the garage sale bin as well as anything I'd had good intentions to "alter" and all I had left was a few basic frames and my stacks and stacks of paper and an overload of pictures I absolutely loved. *Frames larger than your photo. Usually, for a 4 x 6 photo, I use at least a 5 x 7 frame. I don't spend a ton of money on my frames but don't go too cheap, either because they tend to fall apart easier. 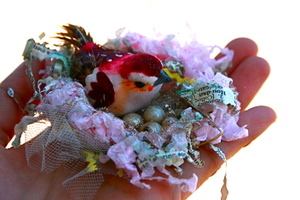 Look at your local craft store, like Michael's or Hobby Lobby. *Good, strong glue. Your frame will likely be standing up and you don't want all your work to fall victim to gravity. 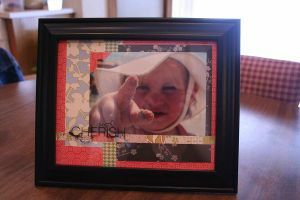 With this frame, I did an easy layout and just dressed it up a bit by adding the rub-on to the outside of the frame, giving it a little extra dimension. For this one, I chose a black mulit-opening frame for Eric's room which coordinates with his furniture. 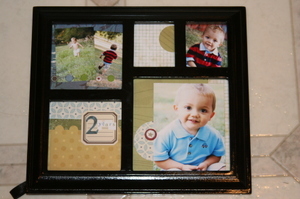 I LOVED so many pictures from his two-year shoot and I wanted to showcase them all, thus the collage frame. You can see details here. 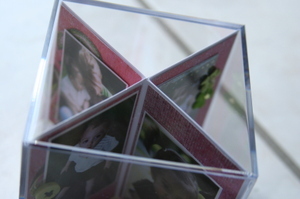 Also, you aren't limited to only frames--what about those photo cubes? Really, the possibilities are endless: frame your initials; frame teeny tiny baby feet; frame your favorites from a recent family shoot. So my challenge to you is rather simple. 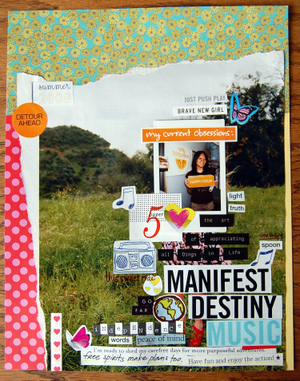 Design a page with the vision board concept mixed in with manifesting destiny. Things you want to bring in your life, things you currently have and love in your life should be included. It can be a "right now these good things are happening and I want more of these good times" page. 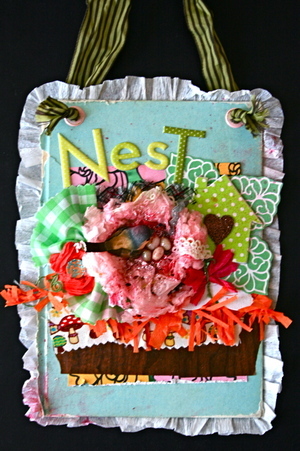 You can flip through magazines and mix them in with your yummy scrappy supplies. It's fun and kind of amazing that the power of thought on a page can really make things happen. 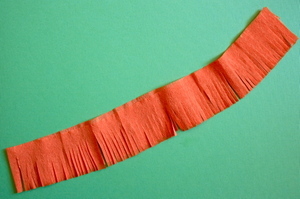 this is lisa & i'm going to show you some nifty techniques using crepe paper streamers! i found some vintage ones at a thrift store & also had tons left over from past parties. you probably have some laying around your house somewhere. 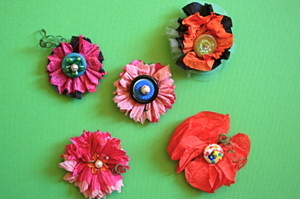 they are very inexpensive & come in almost any color imaginable! why would you want to make those things, you say? when your done, separate & scrunch them up. 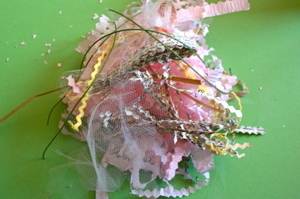 next, add little bits of fibers & paper, ribbon, & thin gauge wire. 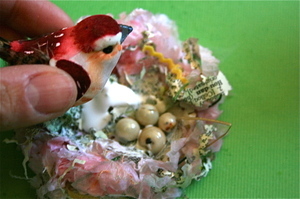 carefully flatten & shape into a little nest. 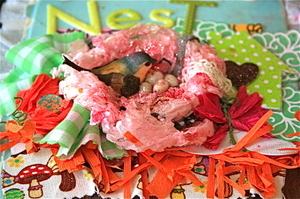 take something round with a flat bottom (like a small bowl or cup) and mold your nest a bit. 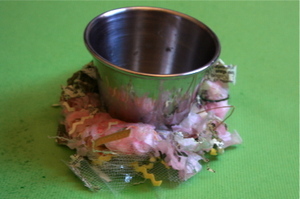 take your cup out, and let your nest dry. 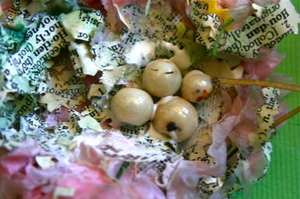 after it's dry, your going to glue some eggs on your nest. let dry & your done! 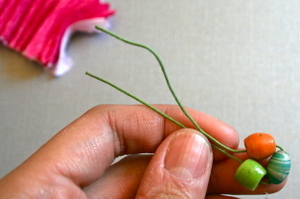 layer them together, and start acordian folding them (or scrunching works, too). lastly, fan out & scrunch up your layers. 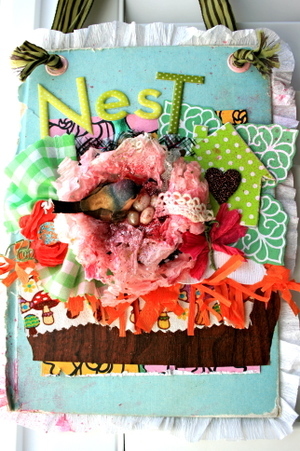 take a vintage book cover & just start piling & assembling things together. for this wall hanging, i used mostly stuff from the "urban prep" collection. i can't wait to see the creative stuff you guys come up with! if you have any questions, please e-mail me at lisa77garay@sbcglobal (dot) net or shoot me a pm through SIStv.